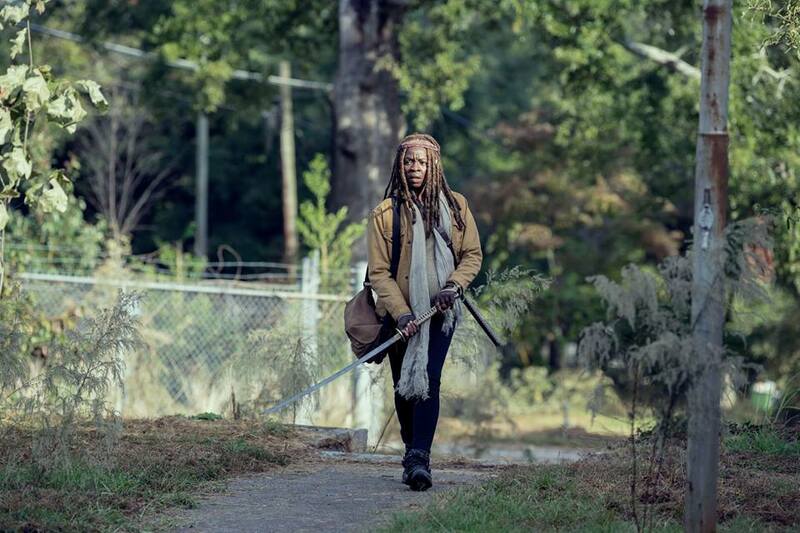 Michonne played a crucial role in this week's episode of "The Walking Dead." HOLLYWOOD—We are inching closer and closer to the end of season nine of “The Walking Dead,” and this latest episode marks quite high on my radar. There was so much going on and it was just so well-written and acted; I loved ‘Scars’ because some major gaps in that time jump were addressed. For those out there wondering how to implement jumps from the past with the present, watch this episode as a pointer. This episode kicked off to give plenty of backstory for Michonne, Daryl, Judith and the things that have transpired in Alexandria since that time jump and a face from Michonne’s past was a major catalyst for it. Things kicked off with Daryl arriving back to Alexandria to get treatment for Henry’s injured leg. However, Lydia’s presence caused a slight ire with some of the residents, but Michonne trusts Daryl. However, we know why she is so skeptical with helping others, including very close allies. A face that Michonne hadn’t seen for over 15 years, Josslyn stumbled upon Alexandria. Aaron and the others were skeptical at first, but Michonne vouched for her pal, that would be a big mistake come later people. Wanting to feel out Lydia, Michonne had a conversation where she urged Lydia to just leave Henry to keep everyone safe. I mean it’s a valid point, but you’re talking to a teen not a mature adult. Daryl bonded with Judith who continued to question why her mother refused to help others. The youngster is far brighter than what people think. Through flashbacks, we learned that Josslyn portrayed by “Queen Sugar’s” Rutina Wesley, was quite close to Michonne in their past life. That would eventually cause our hero to let down her guard; a major mistake. Josslyn was leading an army of child warriors, those ruthless to say the least. In the middle of the night, Josslyn murdered several Alexandrians and stole weapons from the town and kidnapped Judith. That incident played vital role in the present, as Judith decided to chase after Daryl and the others who she suspected needed her help. Michonne exchanged a tense conversation with Negan where she was forced to take a tough look at herself, as Negan considered himself a straight shooter. With Judith off and running, Michonne was a mess, where we learned via a flashback that Josslyn took Daryl and Michonne hostage. We’ve been wondering for weeks where those ‘X’ scars on Michonne and Daryl’s backs came from. We now know how: it was Josslyn and her army of minions. I mean the fact that these kids were placing a beating on Michonne while she was pregnant left me baffled. That kid slicing her pregnant belly, Josslyn beating her pal with a 2 x 4; I see why Michonne did what she did. Was it fun to watch? Not at all, but it was either kill or be killed and she was trying to protect two kids: Judith and her unborn child. Moving back to the present, Michonne was able to rescue Judith in a nick of time, just as the two shared a tender moment about that fateful day in the past that nearly led to the end of the both of them. Judith remembered everything that transpired with her. As the episode concluded, Judith and Michonne met up with Daryl, Connie, Lydia and Henry as they headed to The Kingdom. There was one slight problem; members of the Whisperers discovered the location of The Kingdom. Hmm, this cannot be good; especially considering the fair is upon us with only two episodes remaining. Next week marks the penultimate episode of the season, and I can’t believe I’m saying this, this looks like a good one! Until next Sunday “Walking Dead” die-hards!